Gorgeous, hilly and challenging, the La Jolla Half Marathon welcomes more than 5,000 runners each year — this year is its 36th annual — for a race that unfolds along one of Southern California’s most scenic stretches of coastline, as well as on city streets and through parks like Torrey Pines State Natural Reserve. The race — which also includes the La Jolla Shores 5K — has “several major hills,” organizers report, and takes runners through some of the state’s most scenic views anywhere along its coast, including Torrey Pines Golf Course, the site of the 2008 United States Open golf championship as well as an annual PGA Tour golf tournament. Where does it start? North of La Jolla at the Del Mar Fairgrounds, the point-to-point race course begins. It follows paved city streets from Del Mar to La Jolla, taking runners first on a counter-clockwise circle around Jimmy Durante Boulevard and Viva de la Valle to Camino del Mar, passing by the Jimmy Scripps Bluff Preserve along the way. The course follows through the city of Del Mar for the next couple of miles, along Coast Boulevard, Ocean Avenue and Stratford Court before rejoining Camino del Mar and heading closer to the coast. Amazing scenery. The race’s next few miles, as the course follows along North Torrey Pines Road and heads into the Torrey Pines State Reserve, are some of the most scenic of any road race in America. Runners will pass by gorgeous, steep and rocky bluffs that peer over into the waves of the Pacific Ocean crashing below, as the sails of hang gliders and ultralite flyers pass through the sky in the distance. The course takes runners on a long straightaway through the park and past the famed golf course, and rejoins North Torrey Pines Road as it exits the park. After heading through the reserve, runners follow the course for the next couple of miles along city streets closer to La Jolla, along La Jolla Shores Drive and El Paso Grande before heading back close along the coastline again near Kellogg Park and around the Spindrift Golf Course, a nine-hole par-3 course that’s situated within a tight circle of land just outside the city. From there, it’s just another mile or so in toward the finish line at Ellen Browning Scripps Park, which overlooks the beautiful views of La Jolla Cove. Safety first. Runners are cautioned to always remain within the clearly marked traffic cones and marker lines along the road throughout the race, as portions of it will remain open to traffic during the event. Participants are even encouraged to call out runners who run outside the cones along the course, as it’s a genuine safety hazard. Organizers also caution that footing can be difficult on some of the course’s major hills, so runners should exercise caution when running up and down these hills. Situated along the Southern California coast just a few miles north of nearby San Diego and south of Torrey Pines State Park, La Jolla tends to enjoy mild to moderately warm weather throughout most of the year, and April has brought record temperatures here as low as 41 degrees (in 1945) and as high as 98 degrees (in 1989). On race day (April 28), the average low is 57ºF and the average high is 69ºF. See the race route map for the La Jolla Half Marathon here. To reserve your spot in the spring 2019 running of the La Jolla Half Marathon or La Jolla Shores 5K race, register online at Events.com here. 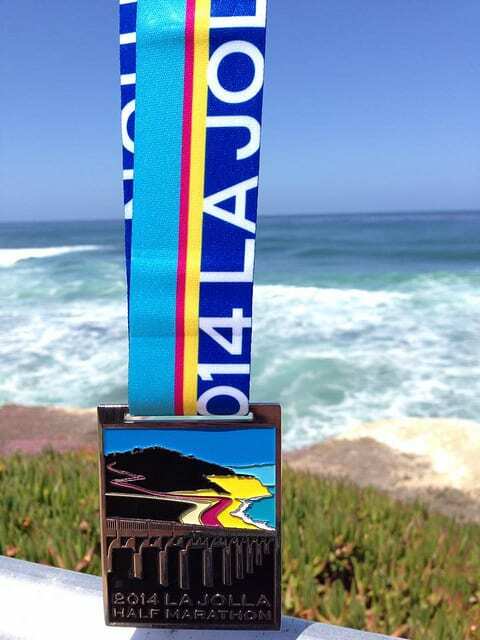 Ever run in the La Jolla Half Marathon? Share your impressions here, or post your review in the Comments below. what is the time limit for the 5k? hey I have a question, when we pay, what charities are we helping?